France’s Foreign Minister, Laurent Fabius, has warned that letting the status quo continue, risks killing of a two-state solution and playing into the hands of ISIS, the Islamic State militants. The expansion of settlements in the Occupied Territories by Israel has already been described by U.N. Secretary-General, Ban Ki-moon, as « provocative acts » that highlight serious questions about Israel’s claimed commitment to a two-state solution. 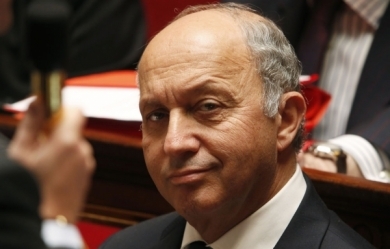 Fabius has previously called for an international support group comprising the Arab League, the European Union and U.N. Security Council members that would essentially force Israel to a genuine negotiating position that would end occupation. However, despite genuine anger in the U.S. administration over Israel’s continuing, illegal settlement policy, there is little prospect of U.S. President Barack Obama supporting any initiative that could upset the U.S. Israel lobby less than a year before a general election. That is because it is not the White House that decides US foreign policy but AIPAC, the Zionist lobby, that has such a disproportionate in uence over Congress, that determines what action, or non-action, the President should take. It’s called, ‘democracy American style’, whereby non-elected political activists, predominately financed by casino profits, determine what position America and the world should take regarding Israel and the Middle East. A frightening scenario that France, for one, is determined to no longer accept. It is to be hoped that all other 27 EU member states will follow France’s example.